I’m telling you, I have been wanting to see this movie since I first heard of it, and it was killing me inside that I couldn’t see it when I was in Germany…or right after I got home. I was a fan of the books when I was a kid, and some of them even scared me so bad that I needed to take breaks from them. They were my King before I got into King. It really hurt me physically not to indulge in my childhood nostalgia and go see this film. But tonight my dad had some free time, and he was like, “Want to go see a movie?” So I said yes. And suffice to say, I was not at all disappointed (and neither was my dad, thankfully). Based on the beloved series of children’s horror books by R.L. Stine (who by the way is Jewish, from the neighborhood I grew up in, and went to Ohio State. Coincidence? 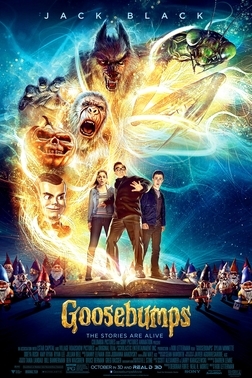 Probably), Goosebumps stars Jack Black as the author himself, living a reclusive lifestyle in the small town of Madison, Delaware with his teenager daughter Hannah. When Zach Cooper moves next door and becomes attracted to Hannah, he starts investigating the mysterious family next door and accidentally causes the monsters from the Goosebumps books–who are very real–to be released from their manuscripts and go on a rampage. Now Zach, Hannah, and R.L. Stine have to get the monsters back in their books before they tear Madison apart. Let me just say, this was a movie with a lot of love and hard work put into it (unlike some other films taking advantage of people’s childhood nostalgia I could name). The story is very well written, and even has some twists in it that I didn’t see coming, and I pride myself on usually being able to see the twists in scary movies. The humor is also very good, keeping the mood of the movie light without getting too ridiculous or stupid. And the actors are just great. Jack Black plays Stine as a misanthrope who finds some way to steal every scene he’s in, while Dylan Mimette (who I’ve always liked whenever I’ve seen him in other works like Scandal or Agents of SHIELD) as Zach is funny and sarcastic and likeable, the kind of guy I’d like to hang out with. The only characters I really had problems with are Champ, Zach’s friend, and Hannah, R.L. Stine’s daughter. Champ is comic relief, and while he’s funny as an awkward teen who just inserts himself into Zach’s life because…maybe he’s lonely and hopes the new kid is too slow to learn to avoid him? I don’t know, but the moments where the humor is a little much do come from him mostly, and he doesn’t contribute much to the story otherwise. As for Hannah…she’s just really there to be a love interest. And unlike River Song from Doctor Who, who was created for that very purpose, there’s not much to her beyond that role she plays. Her actress, Israeli Odeya Rush, is fun and gives off a snarky teen vibe, but that only does so much for the character. Of course, I can’t forget the monsters. That’s the main attraction, the reason people who grew up with the books came to see the movies, because that’s what they remember most. Now obviously, in a movie that’s an hour and forty-five minutes and has to spend time developing characters and getting to the main conflict of the story, you can only spend so much time on each and every monster, which means a lot of them only appear in big group shots, but even in those you see a lot of work went into them. And for the monsters they focus on, they are great. Yeah, a lot of them are CGI, but even then they’re fun to watch. They make you believe they’re there and that we should be scared of them. And Slappy the dummy, who leads the monsters, is like a little mini-Joker. He’s not the best villain I’ve seen on film, but as a talking dummy who enjoys causing chaos for chaos’s sake and to get back at Stine, he does the job well. I could go over some other thoughts I had about the film, but I’ll leave that for the YouTube critics who around next Halloween will be putting out videos going over this movie with a fine-tooth comb. I think instead I’ll just wrap up by saying that this is a fun and wacky horror-comedy, earning a 4.1 out of 5. It may not get kids to read the Goosebumps books if they haven’t read them before, but it’s fun for the whole family and if you know the Goosebumps books already, you’ll enjoy seeing them on screen. The author heard his alarm go off and opened his eyes reluctantly. He wanted to go back to sleep, but today he really couldn’t afford to sleep in, even if he had the day off. So still feeling sleepy, he rolled out of bed, turned off his alarm, and headed to the bathroom. A few minutes later, teeth brushed and freshly shaved, he stepped into the hall, thinking about what he was going to wear and all the errands he was going to run today…when he noticed a tiger in the hallway. The author froze. Even with his glasses still in his room, he knew what he was seeing. Tawny coat, black stripes, big face with whiskers and yellow eyes. There was no mistaking it. There was a tiger in his house. Am I dreaming? he thought. Am I still in bed? The tiger padded towards him, its breathing heavy. Before the author could think how best to react, it stood up on its hind legs, placed both paws on either side of his head against the wall, and licked his face. The author, dumbfounded and amazed, could only laugh as the rough tongue scratched gently at his cheek. What is going on? he wondered, pinching himself to see if he was dreaming. The tiger stepped down and rubbed its head against his stomach. And suddenly the author realized that this wasn’t a tiger, but a tigress. And even stranger, he knew this tigress. He knew her very well. After all, he was her father. “Lizzy?” he said, hardly daring to believe. The tigress regarded him with intelligent eyes before turning around and padding down the stairs. The author wanted to call after her, but then something black streaked out of his room and past his face. He jumped as the black thing briefly stopped and formed a familiar body in the air before rushing down the stairs. Confused, the author went to his room, and saw someone had laid his clothes out for him. The cat didn’t answer, but instead purred loudly and climbed onto the author’s shoulder. Moving through the sea of people and creatures, who all greeted the author with smiles and warm words, he made it to the kitchen, where a teenage girl in a witch’s costume made a plate with a Belgian waffle on it and a mug full of black tea float from the counter to his normal seat at the table. Sitting down, the author thanked the witch and dug in. It was delicious. The author thought about it as he took a sip of tea. He was aware of so many eyes on him, hopeful and expectant. And then a devilish smile came to his face. He knew just what they were going to do today.